We came. We saw. We kicked some…umm…hiney. Pardon the small Ghostbusters quote rewrite, but I was “ghost hunting” with my nine-year-old son. This past weekend, my team (a.k.a. 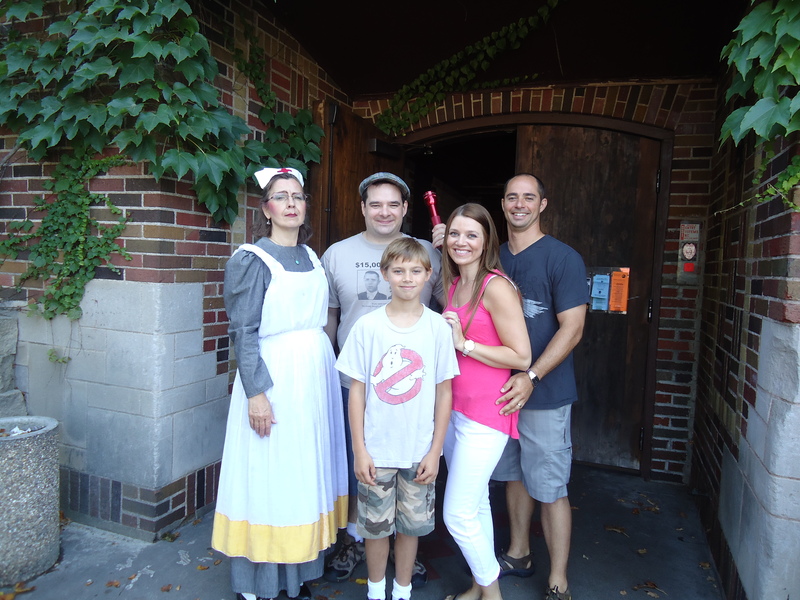 my husband Landon, our son Logan, and myself) braved the “Lost Souls Tour” at the Wabasha Street Caves in St. Paul, MN. A facade was added to the front so it didn’t feel like you were going to have cocktails and get your dance on in a cave dug into the side of hill. 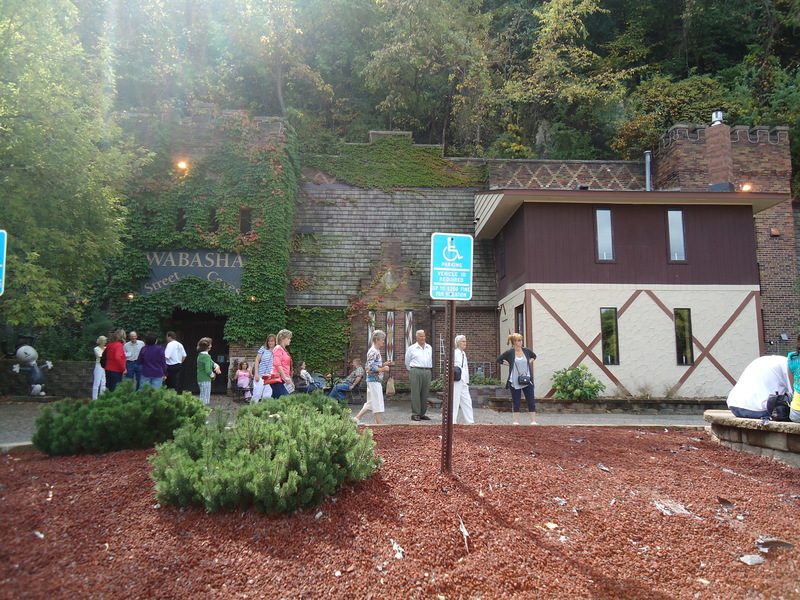 Here’s the back story on our location: the caves were dug into sandstone back in the 1840s. They’ve been used for a variety of things from growing mushrooms and storing food to housing a speakeasy in the 1930s and a disco in the 1970s. It’s said that notorious gangsters like John Dillinger, Ma Barker, and Babyface Nelson all hung out there in its heyday as a speakeasy. The caves presently serve as a banquet hall and every Thursday night, you can swing dance to the music performed by one of their regular live bands – if you’re into that sort of thing. I’m more of a Running Man/Roger Rabbit kind of girl, but I’m guessing that nobody would mind if I rocked-out in a corner to the Big Band music. If I said boo once in a while, they might buy that I’m a spirit, snap a few pictures and leave me alone with my retro-80s dance moves. But we weren’t there for dancin’! We were there for the “lost souls”. So with our camera at the ready (under the chilled and shaking hand of my son), we joined a group of curious tourists and entered the caves, with the lights turned off, following a ghost nurse (though I suspect she might have been an actress) who led us through a series of caves and tunnels. I snapped this shot as we were leaving the cave after they turned the lights on because it was so dark when we entered, I didn’t even notice the sign was there! Anyone see something interesting floating in the upper left portion of the picture? Orb alert! The finished areas were beautiful. One cave housed a long bar where spirits are reported to tap guests on the shoulders, steal keys and hide them, and even poured one bartender another glass of wine after she’d finished sneaking a quick drink while she was closing down (alone). Based on these stories, I’d say these ghosts like to party and hate to see their living friends leave! 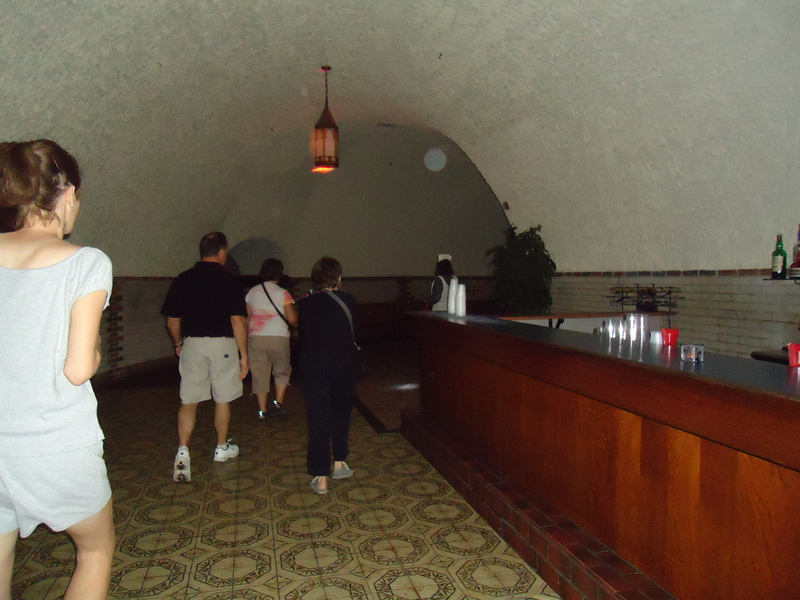 The haunted bar. 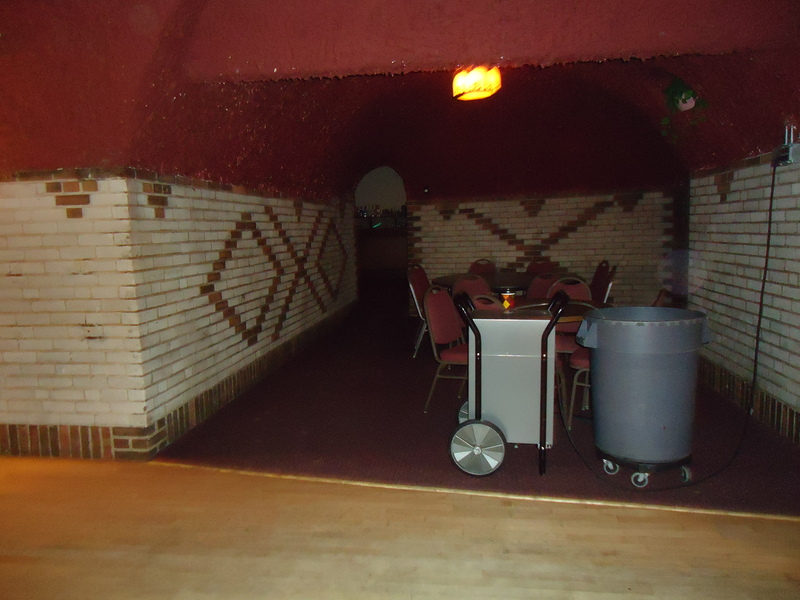 This area is reported to have the most paranormal activity in the caves. Notice the ball of light near the ceiling toward the back of the photo? 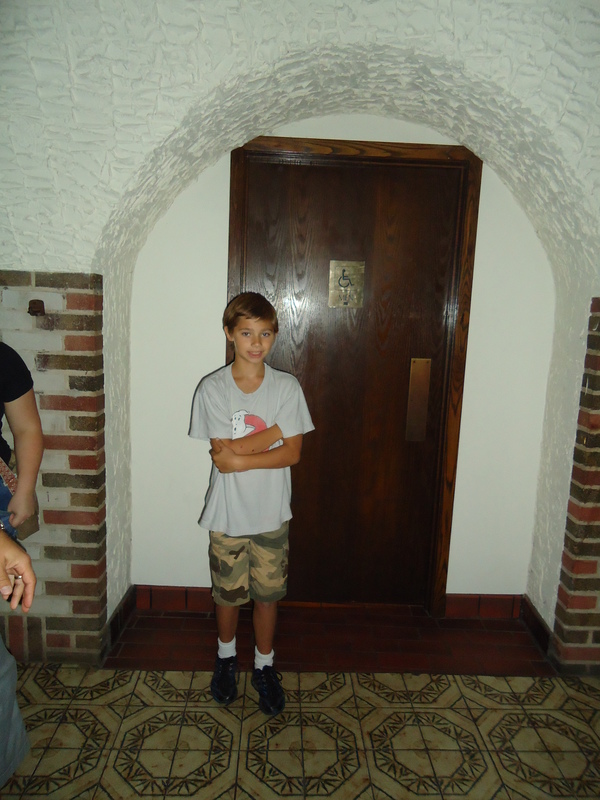 Hmm…an unexplained orb in the most haunted area…interesting! Logan also claimed to feel a small tug on his shirt in this location. Across from the bar is a bathroom where the owners’ young son stumbled upon a gangster ghost adjusting his Fedora in front of the mirror (okay, I might have made the Fedora adjusting part up, but they did say he was wearing a hat, and…umm…I’m a fiction writer, so whatever!). The haunted boy’s room. That handsome boy is Logan – not to be confused with a gangster ghost. Our tour guide, telling us that 3 gangsters were slaughtered in the spot where we stood – in the dark – did I mention she claimed to be a ghost?! Legend has it, the bodies of these murdered gangster are buried in the back caves. Which was, of course, our next stop! Umm…creepy! The unfinished caves, where there are very likely bodies buried beneath our feet, and it’s so cold you could probably see your breath if not for the fact that there are only a few dim candles lighting the tunnels so you couldn’t see your breath if you wanted to. 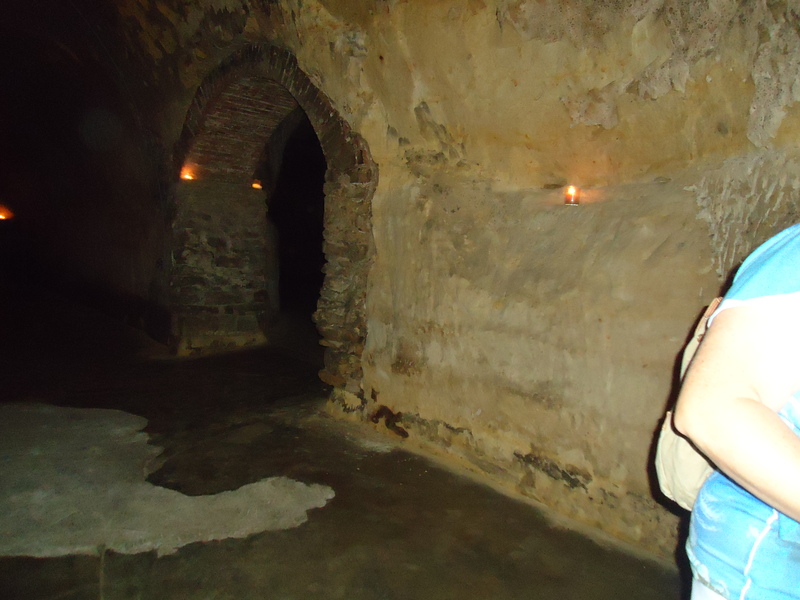 We finished the tour in the dancehall area, where our tour guide and her assistant shared a slide show of photos taken in the caves by other tourist, and guess what…some of those lucky ducks actually got pictures of full-body apparitions! There were a couple that were so creepy that it made my hairs rise (note to self: shave legs before the next ghost hunt to avoid the prickly-porcupine effect when frightened). 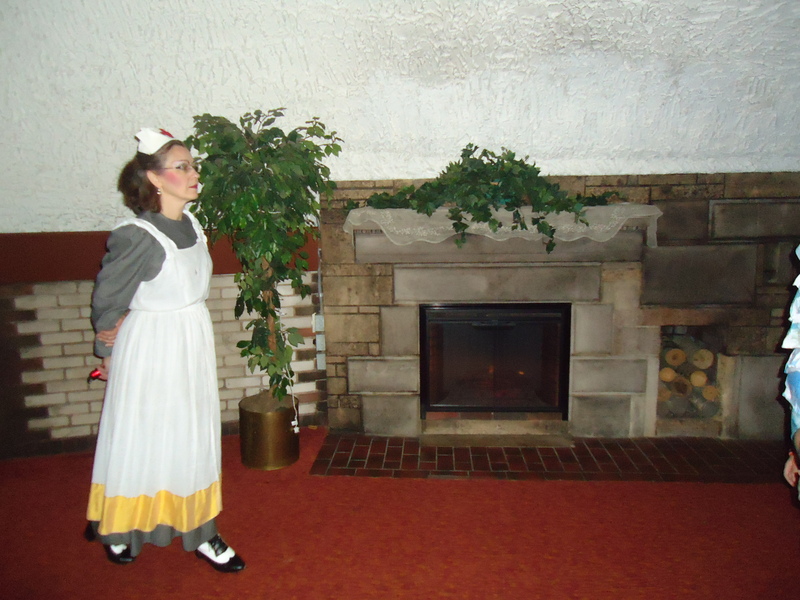 During this time, we snapped a few quick shots, and got some interesting “orbs” in some of our photos. 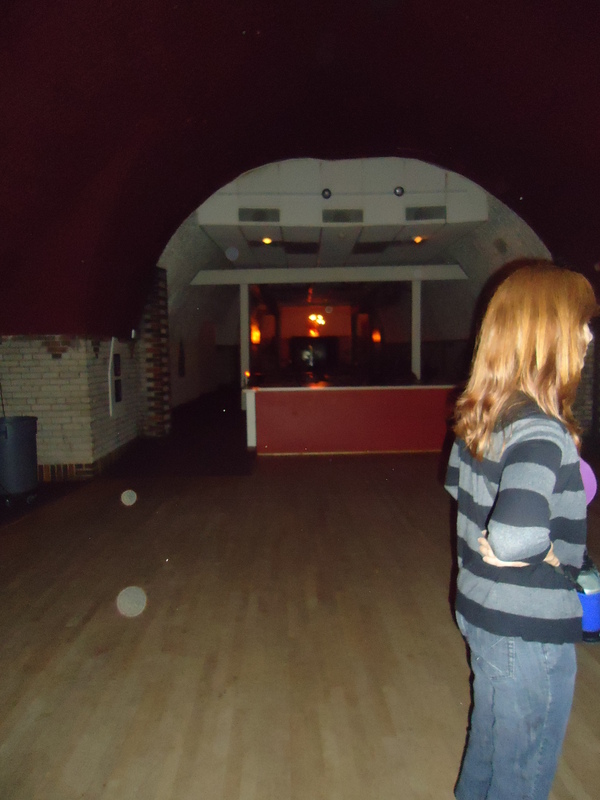 Three pretty good-sized orbs photographed on the dance floor. Maybe they’re swing dancing! Look to the right, just above the garbage can. It’s a little dim, but ginormous! If they were handing out awards for the biggest orb ever photographed, I’m pretty sure we’d win with this bad boy! We ended our trip with a nice snapshot of us with our tour guides and a warm thank you for the wonderful job they did of scaring the bajeebers out of us. Two things: 1) Check out Logan’s Ghostbusters t-shirt – I totally need one of those in my size. 2) Is it just me, or does that guy look like he wants to beat me in the head with his flashlight?! 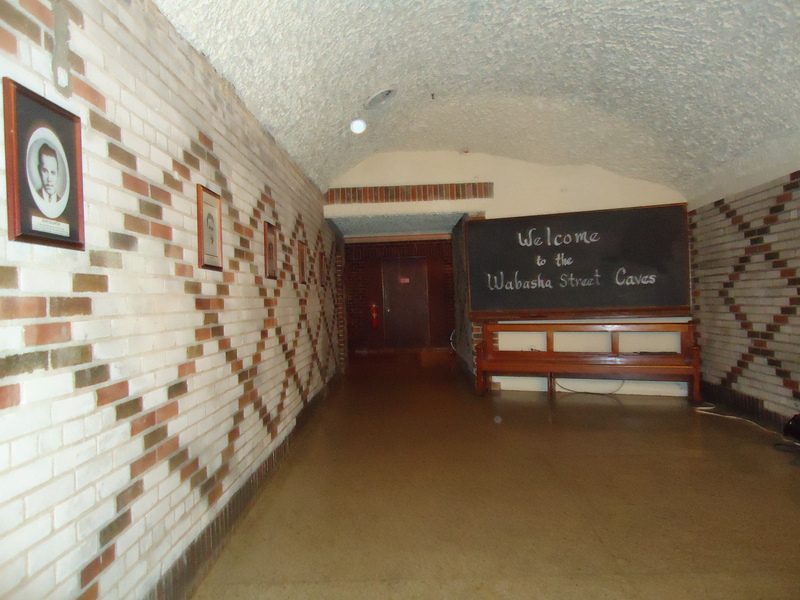 Bottom line: the Lost Souls Tour at the Wabasha Street Caves in St. Paul is worth checking out. Are the caves haunted? Based on the stories and the photos those other lucky tourists shot that our guide showed us, I’d have to say I’m a believer. And I’m pretty sure that once my book is released, this might be the absolute perfect place for a launch party! What a great experience! You’re such a fun mom!! Orbs! Orbs? Ha! Nice. Thanks for the cool recap, Freeberg!